When a nucleus captures a neutron, the binding energy of the neutron is promptly emitted in the form of gamma radiation. The energies of the gamma photons are specific to the nucleus, while their numbers are proportional to the quantity of that nuclide. By analyzing the energy spectrum of these gamma rays, the isotopic and elemental contents of the irradiated sample can be determined. This is the principle of the prompt gamma activation analysis method. The PGAA facility is located near the end position of the neutron guide No. 10/1. It is used for non-destructive elemental analysis of samples by detecting neutron-capture prompt gamma rays. The neutrons are guided from the cold neutron-source of the Budapest Research Reactor to the experimental positions by a neutron guide, which is slightly curved so that it decreases the background coming from the reactor core. Before the main beam enters to the experimental area, it is divided into two sub-beams (upper and lower) by suitable collimators, and the upper beam serves the PGAA facility. 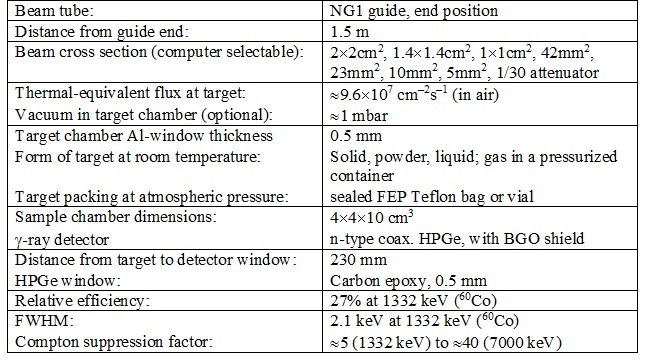 The neutron guide has been recently upgraded with 2Qc supermirror guides that improved the thermal-equivalent neutron flux at the PGAA sample positions to 9.6×107 cm–2 s–1. The beam can be collimated to a maximum cross-section of 2×2 cm2. The intensity of the incoming neutrons is monitored and recorded with an ORDELA Model 4511 N neutron detector throughout the whole reactor campaign. For special experiments, a pulsed beam can also be used. Modulation in the order of milliseconds can be done by a revolving chopper blade, while longer on-off periods can be achieved with a fast beam shutter. 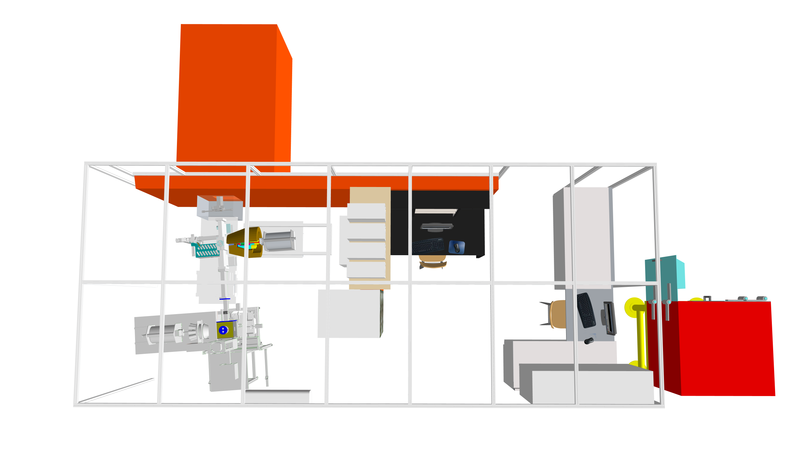 The experimental area is a 3×6.5 m2 space at the rear end of the guide hall (see Figure 1). The neutrons enter the cabin and fly along a 3 m long evacuated aluminum flight-tube across the experimental area, to the beam stop placed at the wall of the guide hall. A pneumatically actuated instrument shutter is used to control the entry of the neutron beam into the cabin while two computer-controlled secondary shutters are in place to allow independent operation of the PGAA and NIPS/NORMA facilities. Independent sections of the modular aluminum flight tube can easily be removed and reinstalled as needed. A series of appropriate size collimators of are used for each beams. At present, the upper beam is used for PGAA measurements while the lower beam is used for NIPS/NORMA experiments. The PGAA target chamber is at 1.5 m distance from the end of the guide. The sample chamber can be evacuated or filled up with gases to decrease beam-induced background. To prevent scattering of neutrons to the PGAA sample from the lower beam, a layer of neutron absorber is placed below the sample. The targets are mounted on thin Al frames by Teflon strings. Optionally, an automated sample changer with a capacity of 16 samples can be used. A neutron absorber after the PGAA target chamber stops the upper beam. 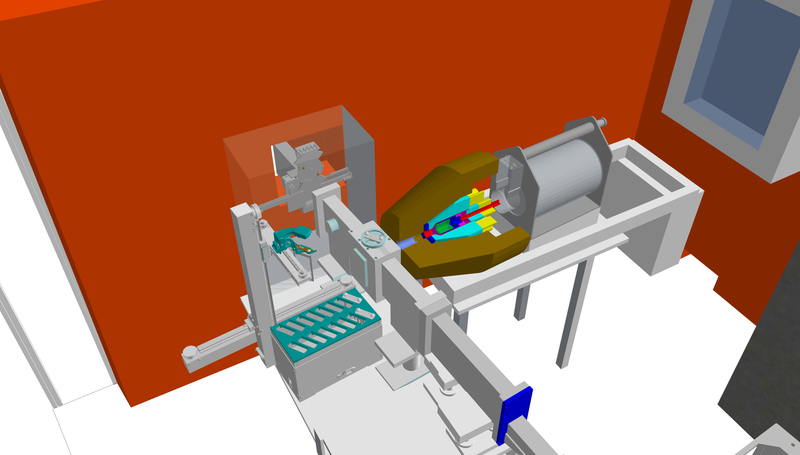 The detector system of the PGAA facility consists of an n-type high-purity germanium (Canberra HPGe 2720/S) main detector with closed-end coaxial geometry, and a BGO Compton-suppressor surrounded by a 10 cm thick lead shielding. The sample-to-detector distance is adjustable, but it is typically 230 mm. By removing the front detector shielding, the HPGe main detector can be placed as close as 12 cm to the target. The BGO annulus and catchers around the HPGe detect most of the scattered gamma photons. If the events from the HPGe and the BGO are collected in anticoincidence mode, Compton-suppressed spectra can be acquired. An analogue spectroscopy amplifier combined with an ADC and an Ethernet-based multichannel analyzer (Canberra AIM 556A) collects the counts. A CAEN N6724 digitizer card with 4-channel input and fibre optic link is an option for advanced list mode data acquisition.